Porcelain veneers are a popular choice for people who want to improve the look of their teeth and are especially good for people with teeth that are worn, eroded, mis-positioned, poorly shaped, slightly crooked, chipped, or have small gaps between them. If you have healthy teeth and gums, but are unhappy with the way your smile looks, porcelain veneers may be a quick and easy solution. In a relatively short amount of time, without the need for extreme tooth preparation, Dr. Spelman can create a new more pleasing smile. Veneers help brighten front teeth that have permanent stains or discoloration and can’t be whitened; giving you a dazzling, brighter smile. Your custom-made veneers will be ordered with specific instructions for the changes you want to see and in as little as two weeks, you will have the custom-made porcelain veneers back from the lab and permanently bonded to your teeth. 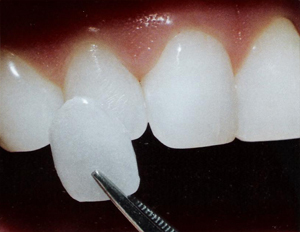 Veneers are matched in size and shape to your teeth and reflect light in much the same way your natural teeth do. Porcelain veneers can also be color selected.